Going to the Academy Awards ceremony is exciting, even if you are a Hollywood regular like Jim Henson. It is thrilling to be part of the entertainment community at such a high level and gain recognition for your work on a telecast that goes into homes across the country. In tribute to the success of The Muppet Movie and its nominations in the best score and best song categories, Kermit the Frog and Miss Piggy were asked to appear on the award show in 1980 to explain the rules. Miss Piggy was miffed, of course, because she was not nominated for best actress, but that’s another story. In 1982, Jim once again donned his tuxedo and flew out to LA for the awards. While the second Muppet feature The Great Muppet Caper had been deservedly considered in the special effects area, it was the music that was nominated. 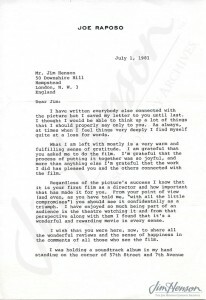 Jim was delighted and gratified to get this public acknowledgement of one of his most important professional collaborations – his work with lyricist and composer Joe Raposo. Jim met Joe in the late 1960s through Jon Stone when they were developing the television special Hey Cinderella! 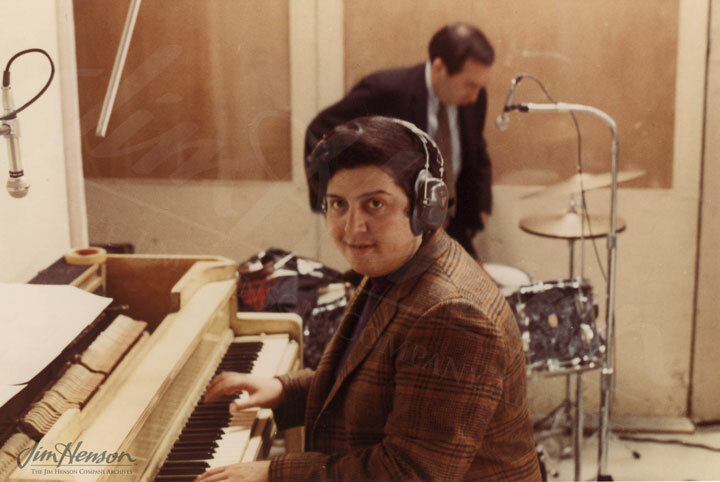 Joe wrote the music for the show and then joined the team as musical director on the first season of Sesame Street. Kermit’s anthem on racial tolerance, Bein’ Green, is considered to be the song most closely connected with him and was written by Joe for Jim. 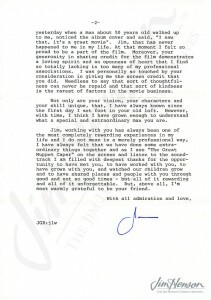 Joe wrote hundreds of songs for Sesame Street but the work on The Great Muppet Caper, the first film that Jim directed, was a true joy for both men. Jim set his sights high and had his characters ride bikes, perform Busby Berkeley style musical numbers, climb up sides of buildings, and catch jewel thieves. Joe was equally ambitious and his songs demonstrated his abilities with a range of musical genres, and his lyrics gave voice to the characters’ thoughts and feelings and expertly moved the action along. Although “The First Time It Happens”, the nominated song that Miss Piggy (Frank Oz) had so expressively performed, did not win the Oscar, the whole experience was clearly a creative high point for both men. 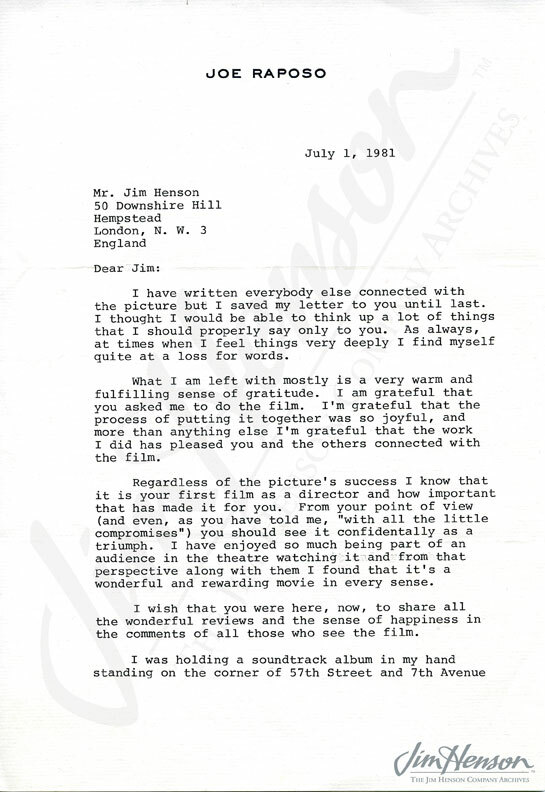 After the movie, Joe wrote Jim a heartfelt letter describing his pleasure in their work together. Jim responded with a telegram echoing the sentiments. The two continued working together throughout the 1980s until Joe’s untimely passing in 1989. A young Joe Raposo creating music for an IBM meeting film, 1968. 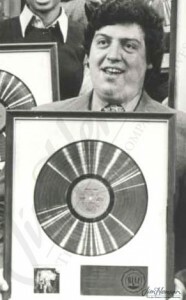 Joe Raposo and his Sesame Street album Gold Record award, 1970. 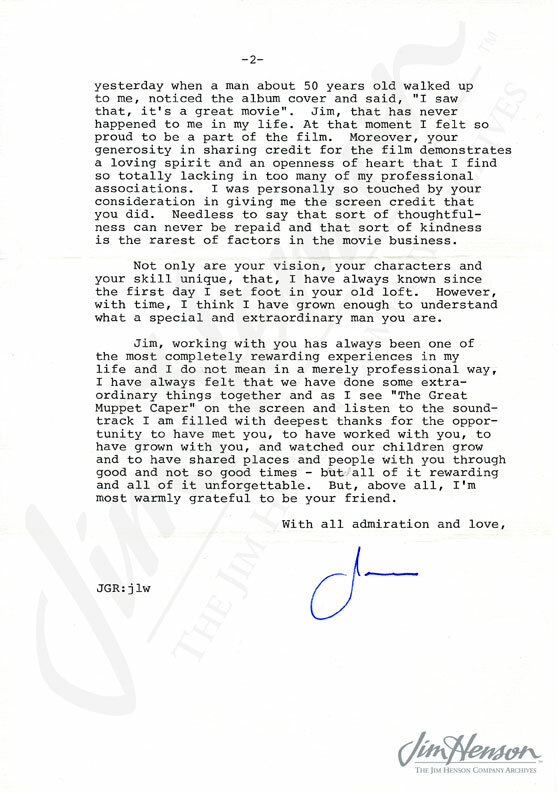 Joe Raposo’s letter to Jim about his work on The Great Muppet Caper, 1981. This entry was posted in 03-March '82, 1982, Appearances, Great Muppet Caper and tagged Academy Awards, Joe Raposo, Kermit, Miss Piggy. Bookmark the permalink.